Hosted by the BGRIMM Technology Group (former Beijing General Research Institute of Mining & Metallurgy), the 9th World Conference of Sampling and Blending (WCSB9) will be held in Beijing in May 2019. The conference aims to cover current research and theory in the field of sampling and blending, and share the latest technological knowledge, operational practices and advances in the field. The application areas covered by the conference will include mining, cement, food, feed, pharmaceuticals, agriculture, biology, and environmental protection. The last 8 conferences have been held in Denmark, Australia, Brazil, South Africa, Chile, Peru and France, and now WCSB9 comes to China in 2019. The Japan Geoscience Union Meeting brings together researchers in differing specialties from many institutes throughout the world. In 2019, the JpGU Annual Meeting will take place at Makuhari Messe, Chiba, Japan from 26 (SUN) to 30 (THU) May 2019. The 7th International Computational Modelling Symposium (Computational Modelling '19) which is organized by Minerals Engineering International (MEI) is to be held at the National Maritime Museum Cornwall, an independent museum located on Discovery Quay in Falmouth. The aim of this conference is to bring together both users and developers of computational modelling from academia and industry to share their knowledge and expertise. This conference is aimed at the full spectrum of people involved in computational modelling in minerals processing and materials handling, from model development, validation and all the way through to application. Goldschmidt is the foremost annual, international conference on geochemistry and related subjects, organized by the European Association of Geochemistry and the Geochemical Society. Goldschmidt 2019 will be held in CCIB in Barcelona. The 9th European Conference on Mineralogy and Spectroscopy (ECMS 2019) will take place in Prague, Czech Republic, on September 11–14, 2019. ECMS 2019 will deal with mineralogy, spectroscopy and related fields of science, with a special focus on the interplay between short-range and long-range information to account for crystalline and amorphous materials physical properties. The Conference will bring together both theoretically and experimentally oriented scientists, providing them with an opportunity to share ideas and learn from one another. The MEC2019 be held during 16–19 of September, 2019 in Kocierz, Poland. This year, Minerals is pleased to sponsor the Best Presentation Award. MEC has become one of the most highly acclaimed meetings for representatives of both science and industry working in the field of mineral engineering in Europe. 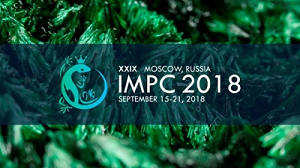 The MEC2019 for the third time is consisting of 15th International Conference on Non-Ferrous Ore Processing (ICNOP), 56th Symposium of Physicochemical Problems of Mineral Processing and 24rd International Conference of Mineral Processing. The Conference will include plenary section delivered by invited foreign and domestic scientists, as well as oral and poster presentations. The International Biohydrometallurgy Symposium (IBS) is the biannual global conference on biohydrometallurgy, bioremediation, and the related subjects. These sciences and technologies have a high potential to establish environmentally-favorable processes in mining industries for the recovery of base/precious metals from primary/secondary resources including urban mines, and for the remediation of exploited mining sites. Any other industries dealing with metals and metalloids can also benefit from advances in biohydrometallurgy. The 9th International Flotation Conference (Flotation '19) which is organized by MEI in consultation with Prof. Jim Finch is to be held at the Vineyard Hotel, Cape Town, South Africa. The EGU General Assembly 2019, taking place in Vienna (Austria) on 7–12 April 2019, will bring together geoscientists from all over the world to one meeting covering all disciplines of the Earth, planetary, and space sciences. TMS 2019 Annual Meeting & Exhibition is to be held at the Henry B. González Convention Center, San Antonio, Texas, USA. It will present more than 80 symposia planned by all five TMS technical divisions and covering a broad range of topics related to minerals, metals, and materials science and engineering. The TMS 2019 brings together more than 4,000 engineers, scientists, business leaders, and other professionals in the minerals, metals, and materials fields for a comprehensive, cross-disciplinary exchange of technical knowledge. 130th Annual Meeting of the Geological Society of America (GSA 2018) will be held in Indianapolis, Indiana, USA on 4–7 November, 2018 at the Indiana Convention Center & Lucas Oil Stadium. As an international scientific society, GSA serves members in academia, government, and industry around the world. Since 1888, GSA's meetings, publications, and programs have enhanced the professional growth of geoscientists and fostered geoscience stewardship and service. GSA encourages cooperative research and public dialogue on geoscience issues and supports all levels of earth-science education. The International Mineral Processing Congress has been in existence now for more than sixty years. The very first congress was held in September 1952 in London, and with 39 technical papers and 332 delegates, it was indeed an impressive beginning of a series of ever growing congresses. The IMPC has been a major driving force for the promotion of scientific and technical knowledge in mineral processing and extractive metallurgy worldwide. It is the most prestigious event in the field of mineral processing in the world today. The congress has been truly international with delegates from all parts of the world deliberating on issues facing the mining and minerals processing industry globally.For more information please refer to the website. The International Mineralogical Association is an umbrella organisation uniting professional associations from 38 countries, and its quadrennial meeting is the largest global forum for making contacts and exchanging information with mineral scientists from around the globe. The 22nd meeting in Melbourne, Australia, will be the first such meeting held in Australia and only the second in the southern hemisphere. The meeting will be hosted by the Geological Society of Australia, and held in the Melbourne Convention and Exhibition Centre, between 13–17 of August, 2018. Goldschmidt is the foremost annual, international conference on geochemistry and related subjects, organised by the Geochemical Society and the European Association of Geochemistry. 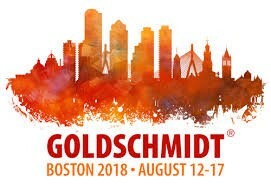 The Goldschmidt2018 will be held in Boston, MA, USA from 12 to 17,June 2018. 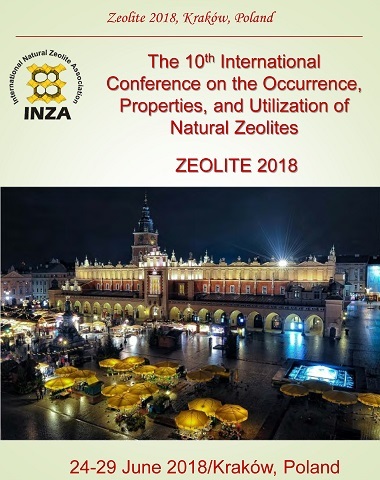 The 10th International Conference on the Occurrence, Properties, and Utilization of Natural Zeolites (Zeolite 2018) will be held in Kraków, Poland from 24 to 29 June 2018. For more detailed informations about the event please visit the website. The 2018 International Conference on Nanogeosciences (ICN2018) will be held in Guiyang, China during 22–26 June 2018. ICN2018 aims to provide an exciting platform for researchers all over the world to present and discuss their latest achievements in Nanogeosciences. It is co-hosted by the Specialized Committee of Nanogeology, Geological Society of China, and the Chinese Society for Mineralogy, Petrology and Geochemistry. The local organizers include the Institute of Geochemistry, Chinese Academy of Sciences, the State Key Laboratory of Ore Deposit Geochemistry, and the State Key Laboratory of Environmental Geochemistry. We sincerely invite you to present your work in the forthcoming conference. The deadline for abstract submission and early bird registration (via email: [email protected]) is now extended to 20 April 2018. For more details, please visit the conference website (http://nanogeosciences2018.csp.escience.cn/). Upon completion of the conference, authors have the opportunity to submit their work for publication in a special issue of the internationally refereed journal Minerals (ISSN 2075-163X; Impact Factor 2.088, https://www.mdpi.com/journal/minerals). Guiyang is the capital city of Guizhou Province situated in the southwest of P. R. China. It is well-known as China’s first “Forest City” and one of the best summer resorts. The venue is conveniently close to many renowned geologic features including Karst Cave, Danxia landform, Triassic fossil Group, and Carlin-type gold deposits in Southwest Guizhou. The city is also a good place to enjoy cultural heritage and unique cuisines. The 55th Annual Meeting of the Clay Minerals Society will be held at University of Illinois at Urbana-Champaign. Minerals has sponsored the conference as a media partner. Modern mining needs to be profitable, it should operate with environmental integrity, be considerate of social concerns and be supported by effective government systems. At the same time, mining companies face operational challenges. Such challenges will only be solved through very important changes, in the way the mining sector engages with society, uses energy, protects the environment, educates professionals and pursues innovations. Mines of the future will need to be different to those of today. The key objective of the 1st International Conference Mines of the Future is to share the latest developments on mining expertise, activities, developments and research that support mines of the future. Mines of the Future will offer a special focus on the EU Horizon 2020 [email protected] project. We invite professionals from the mining industry and practitioners from consulting companies, equipment suppliers and software providers, people from research institutions and government agencies as well as university scholars to attend this Conference. An additional objective of this Conference is to encourage MSc and PhD students to showcase their research. Upon completion of the conference, authors have the opportunity to submit their work for publication in a special issue of the internationally refereed journal Minerals (ISSN 2075-163X; Impact Factor 2.088, https://www.mdpi.com/journal/minerals). Deadline for manuscript submissions: 31 July 2018. We look forward to welcoming you at this unique Conference. The General Assembly 2018 of the European Geosciences Union (EGU) is held at the Austria Center Vienna (ACV) in Vienna, Austria, from 8–13 April 2018. The assembly is open to the scientists of all nations. The entire congress centre is fully accessible by wheelchairs. The EGU General Assembly 2018 will bring together geoscientists from all over the world to one meeting covering all disciplines of the Earth, planetary and space sciences. The EGU aims to provide a forum where scientists, especially early career researchers, can present their work and discuss their ideas with experts in all fields of geoscience. The EGU is looking forward to cordially welcoming you in Vienna. Fall Meeting is the largest and preeminent Earth and space science meeting in the world. The 2017 Fall Meeting will take place in New Orleans, Louisiana, offering attendees the chance to discover a new location that features world-renowned cuisine, music, arts, and culture, and provides access to vital scientific ecosystems. Fall Meeting will offer a unique mix of more than 20,000 oral and poster presentations, a broad range of keynote lectures, various types of formal and informal networking and career advancement opportunities, scientific field trips around New Orleans, and an exhibit hall packed with hundreds of exhibitors. The GSA 2017 will be held in Seattle, WA, USA, from 22 October to 25 October 2017. The Goldschmidt Conferences® were started in 1988 by the international Geochemical Society (GS) to provide a forum for its members to discuss their latest research. The conference is named in honour of Victor M. Goldschmidt (1888–1947), whose classification of the behaviour of the elements in the Earth and meteorites laid the basis of modern geochemistry. Each year, the conference brings together thousands of scientists from throughout the world to talk about subjects including the origin of the Earth and planets, the chemical processes that have shaped Earth's evolution over time, the interconnections between life and the physical world, the search for new resources, and the environmental challenges facing today's world. The 6th International Symposium on Mining and Environmental Protection will be held on June 2017 in Vrdnik, Serbia, organized by the University of Belgrade, Faculty of Mining and Geology in Belgrade –center for environmental engineering. Previous Conference, were very successful. Scientist and companies from many countries gathered to share experiences, information and research results. The objective of this Conference is to bring together engineers, scientists and managers working in mining industry, research organizations and government organizations, on development and application of best practice in mining industry in the respect of environment protection. The Institute of Mineral Resources Engineering of RWTH Aachen University is pleased to announce the 2nd International Conference Mining in Europe which will be held from 07 to 08 June 2017 in Aachen, Germany. Today, the global mining community faces significant challenges, ranging from technological to social, environmental and economic issues. The mining community has confronted and solved such challenges over centuries and has thereby delivered important contributions to the use and development of our mineral resources. Authors are invited to submit abstracts (up to 300 words) for possible inclusion as poster or oral presentation in the Conference program. Abstracts are to be submitted electronically via the Conference portal. Abstract submission is due by 1 April 2017. Upon completion of the Conference, authors have the opportunity to submit their work for publication in a special issue of the internationally refereed journal “Minerals” (ISSN 2075-163X, Impact Factor 1.5, https://www.mdpi.com/journal/minerals). For further information, please visit our AIMS 2017 Conference website http://www.aims.rwth-aachen.de. If you need more details or logos please do not hesitate to contact us. International Geological Congress (IGC) is the prestigious global platform for advancement of Earth Science. The first session of IGC assembled in 1878 in France with an aim to provide the global geological community with an opportunity to create an organizational frame work for meeting at regular intervals. It envisaged a spirit of fraternal cooperation that transcends boundaries, languages and has the ability to bring together the geoscientific community across the continents and oceans. Founded as a non-profit scientific and educational organization in 1878, IGC came under the aegis of International Union of Geological Sciences (IUGS) in 1961. Since then the meetings of IGC are held in collaboration and under scientific sponsorship of IUGS (http://www.iugs.org). For more information please refer to the website. The GSA 2016 will be held in Denver, CO, USA, from 25 September to 28 September 2016. The IMPC 2016 will be hosted in Québec City, Canada. The conference is expected to gather over 1,000 professionals and academics from the mining industry representing approximately 60 countries. Top universities specializing in mineral processing, all major mining companies, plus the leading providers in the world of services and technologies will attend the congress. The technical sessions will facilitate knowledge exchange, analysis and discussion of the most recent innovations in themes related to mineral processing. Following the success of the 1st European Mineralogical Congress held in Frankfurt in 2012, emc2016 will showcase the state-of-the-art of mineralogical sciences, promoting exchange of new research results between the European- and international- countries. The title of the emc2016 has been conceived to echo the aphorism by late C. V. Guidotti (19.09.1935–19.05.2005) “Minerals, the Alphabet of Geology, and Rocks, the Words of Geology”. It is meant to convey the message that dealing with mineral sciences in their broadest sense is nothing else that trying to understand what the dynamic Earth is telling us, and that the big picture may be reconstructed by carefully putting together the small parts. Over the five-day program, combining more than forty scientific sessions and six plenary lectures delivered by world-renowned scientists, you will get the chance to engage with all aspects of mineralogical sciences, and have an opportunity to learn and be challenged by the content. The 26th Goldschmidt Conference will be in Yokohama, Japan on 26th June to the 1st of July 2016. The conference will cover all aspects of geochemistry and related fields. The scientific program of EUROCLAY 2015 will bring together, in an exciting, leading-edge programme, specialists from different disciplines related to clays and clay minerals. It will consist of technical sessions of both oral and poster presentations with a generous quota of invited speakers who are the leaders in their respective fields. Pre-meeting workshops and mid-meeting field excursions will be integral parts of the scientific program. A key aim of this conference will be to integrate industrial and academic workers, with sessions which cover both areas. The Californian Goldschmidt will take place in Sacramento between June 8th and June 13th, 2014. Goldschmidt2014 will follow the pattern established for the recent Goldschmidt conferences, and should be the prime forum for all recent developments in Geochemistry and related fields. A diverse scientific program is currently being developed including a MAC-sponsored short course of cathodoluminescence applications in geoscience and GAC sponsored workshops on remote sensing and structural geology of ore deposits. Currently, biomineralization is evolving from its heyday of structural research into one of the most existing fields of biological materials science, molecular biology, biomedicine and biomimetics. The International Symposia on Biomineralization possess over forty years of tradition. The first symposium was held in Mainz, Germany in 1970. Many highly successful symposia held in subsequent years, the most recent in Japan (2001), Chile (2005), China (2008) and Australia (2011). This is the second time the symposium has been held in Germany, and while there is a lot to live up to, this symposium promises to be another stimulating and memorable event. Freiberg (German: free mountain) is a university and mining town in the Free State of Saxony, Germany. The Bergakademie Freiberg is one of the five leading mining schools in the German-speaking countries. It is the oldest in the world, with strong roots in tradition that inform it as a modern centre for teaching and research. In recent times Freiberg has made a name for itself throughout Europe as both a high-tech location for micro technology and renewable energy; as well as a center for mineralogy, materials science, and solar technology. Nowadays, the modern equivalents of old Freiberg's silver are silicon and gallium arsenide. The BIOMIN’12 international symposium aims at bringing together scientists from different backgrounds all interested in understanding the principles of biomineralization and demineralization. Discovery of these natural principles leads to direct, practical applications in biological materials science, biomedicine, and technology. Scientific topics shall include the following: evolutionary aspects of biomineralization, molecular and genetic regulation of Calcification and Silicification from bacteria to vertebrates, pathological biomineralization and biomineral formation under extreme environmental conditions, and modern analytical methods and biomimetics. Our symposium will host five invited keynote lectures, oral, and poster contributions. The scientific committee cordially invites you to take part in this traditional international event and looks forward to welcoming you to Freiberg. The conference will focus on the application of CFD in the oil and gas, metal production, mineral processing, power generation, chemicals, food and other process industries. The Conference will feature presentations on various aspects of mineral processing including operations, plant flotation, advanced technologies, gold processing, hydrometallurgy, rare earths, industrial and energy minerals and comminution. The World Resources Forum (WRF) is an independent, international platform to discuss the economic and political implications of the current resource use trends, advocating innovation for resource productivity. The largest event dedicated to the Coal Seam Gas industry in Australia return to Brisbane in 2011. Australia's coal seam gas sector continues to grow at pace with numerous large scale projects commissioned. IIR's CSG 2011 is ideally positioned to take advantage of the latest developments in the industry and provide you with an unrivalled learning and networking forum. CIM is bringing its world-class mining event to the beautiful city of Montreal in 2011. The 2011 CIM Conference and Exhibition 2011 will be held in Montreal, Quebec, from May 22 to 25, 2011. This year's venue — the Palais des congrès de Montréal - will offer conference delegates and exhibitors alike an unforgettable experience! The venue is located near the city's finest hotels and restaurants. This congress is a special opportunity for specialists, academics, students and companies that work in automation, to discuss the actual tendencies and future tecnologies applied in the mining industry, as well as interchange experiences of successful applications and share innovative projects and case studies. Automining 2010 is organised to provide an international forum where professionals can meet, interact and discuss innovations and recent developments related to automation applied to mining, mineral processing, pyrometallurgy, hydrometallurgy, electrometallurgy, and metal manufacturing. To promote an international network for collaboration and technical exchange among professionals dedicated to the development, operation and maintenance of automation systems for the mining industry. This conference is about providing attendees with an advantage. Every person’s job is about adding real value and this conference will enhance your ability to do this. It is about providing knowledge and up-to-date information on what surface mines are achieving with their equipment; and what suppliers and organisations around the world are doing which can add Real value to your operation. Milwaukee has been chosen as the venue to allow visits to Bucyrus, P&H and Cat facilities (in Peoria).